To be without God and to die of it. I find myself in a phase of grief where from time to time during the day I feel acutely lost without my husband, the absence of him like a soreness in my spirit, an ache in the middle of my chest telling me that something is very wrong with me. Yes, something is wrong!! It’s death that is wrong – it’s wrong for us to be separated, for me to lose the heart of my heart. I have known this truth in my mind and for the world generally – now I understand it in my bones. When in the Apostles’ Creed we repeat “And he descended into Hell,” we very often think “That’s one of those expressions,” and we think of Dante and of the place where all those poor people are being tortured with such inventiveness by God. But the Hell of the Old Testament has nothing to do with the spectacular hell of Christian literature. The Hell of the Old Testament is something infinitely more horrid; it is the place where God is not. It is the place of final dereliction; it’s the place where you continue to exist and there is no life left. And when we say that he descended into Hell, we mean that having accepted the loss of God, to be one of us in the only major tragedy of that kind, he accepted also the consequences and goes to the place where God is not, to the place of final dereliction; and there, as ancient hymns put it, the Gates of Hell open to receive Him who was unconquered on earth and who now is conquered, a prisoner, and they receive this man who has accepted death in an immortal humanity, and Godlessness without sin, and they are confronted with the divine presence because he is both man and God, and Hell is destroyed — there is no place left where God is not. The old prophetic song is fulfilled, “Where shall I flee from thy face — in Heaven is thy throne, in Hell (understand in Hebrew — the place where you are not), you are also.” This is the measure of Christ’s solidarity with us, of his readiness to identify himself, not only with our misery but with our godlessness. If you think of that, you will realise that there is not one atheist on earth who has ever plunged into the depths of godlessness that the Son of God, become the Son of Man, has done. He is the only one who knows what it means to be without God and to die of it. Today was full of the Lord! The first thing I did on rising was go to church and take a turn reading Psalms by candlelight next to the “tomb” of Christ that had been erected on Friday and bedecked with Easter lilies. 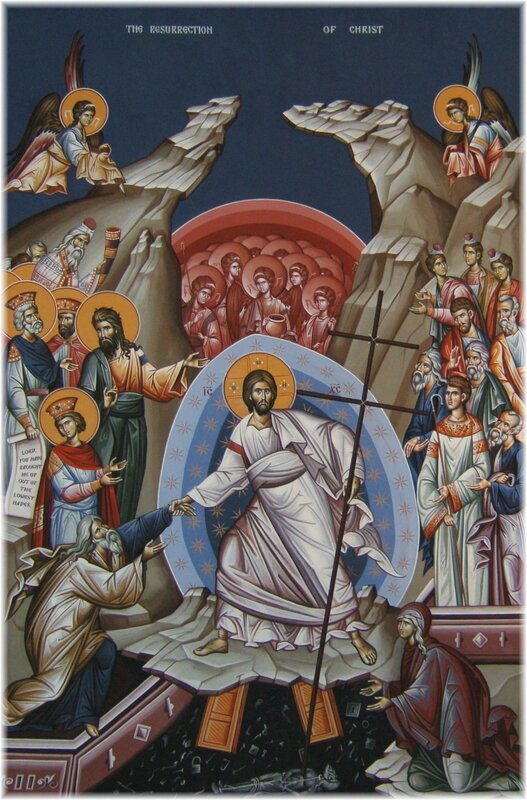 It is a special icon representing our Lord lying in the grave, and from the end of Friday night’s service the Psalms are read continuously until the next service, which was at 1:00 today. The Orthodox also read Psalms all night by the casket of any church member at death. And if one is all alone in the church in the near dark — well, one is not alone, because God is there always, and not only He, but the saints who live and form that great Cloud of Witnesses, who are praying with us. It’s a very intimate and loving hour, and a blessed opportunity to participate in such a work. In the middle of the Vesperal Liturgy of Holy Saturday we had baptisms. Once again we are at the anniversary of my own baptism on this day, four years ago now, and that adds to the gravity and joy of standing with those who are being newly illumined. During Lent the catechumens have been preparing for Holy Baptism, and the rest of the church pray extra on their behalf, and in our hearts and in repentance rededicate ourselves, remembering our own illumination. Today there were six people baptized, praise God! Two couples, each with a very young boy-child, and they used our new sunken baptismal font that is just outside the church, filled with 90° water, which I’m sure made it easier for the little guys to suffer being immersed. The skies were dry, which made watching easier for all of us. In spite of the momentary displeasure and crying of the babies, everyone was beaming with smiles and songs. Also during the service today we heard 15 Old Testament readings that have been familiar to me most of my life, but they are becoming even more beloved every year, as we hear passages as long as the whole book of Jonah and as short as the couple of paragraphs from Jeremiah that it has been my lot to chant three years in a row now. When Tom started reading the account of Abraham taking Isaac to the mountain to make a sacrifice, I realized that I have heard him read it every year, and from now on will never be able to read that moving story without hearing his voice. We change all the altar cloths from purple to white in the middle of this service as well, two or three people nearby stepping up to do the quick work at the same time as men are lighting the chandelier and the choir is singing. Of course the choir is singing! There is rarely a quiet time during our services, filled as they are with prayers, Scripture, and hymns. Mr. Glad went with me on Thursday evening for the Matins of Holy Friday, during which 12 Gospel passages are read, including the whole of several chapters of John, by the clergy in the center of the church. It’s a kind of total immersion in the events of Christ’s Passion, and requires three hours to get the full effect — but you get it. Last night was Matins and Lamentations for Holy Saturday. The Lamentations consist of the whole chapter of Psalm 119, its verses interspersed with poetic verses pertaining directly to the Passion of Christ. But I didn’t go to that. I’m too old to stay up past my bedtime several nights in a row, and I wanted to be sure to make it tonight. Tonight about midnight we will process around the church with candles — and maybe in the drizzle, if the weather doesn’t change quickly. Once we are back inside, a large portion of the first chapter of John will be read, often in more than one language. We will begin the happy shouts and songs of “Christ is risen!” and hymns that are the most rousing of the whole church year. 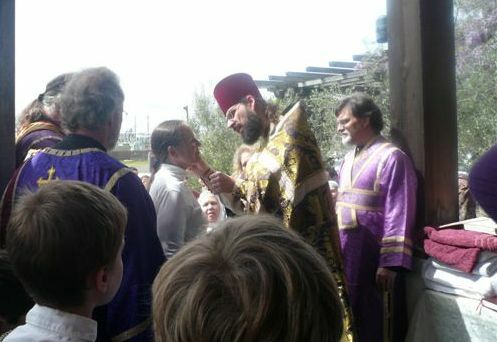 The priests and deacons will make the rounds among the people innumerable times with censing and with recitations of “Christ is risen!” and “In truth He is risen!” in many different languages in turn. Sometimes I see a cheat sheet floating around that shows these phrases, but I’m always a little too scattered to make up for my lack of preparedness right then. It’s very chummy, because we get a lot of visitors or once-a-year-ers and we fill the house. One has to pay attention to the candles to be sure that they don’t catch someone’s hair or long white scarf on fire. Many children fall asleep on the floor as the festivities continue. The day of my baptism I was so thoroughly done-in that I couldn’t help looking again and again at the sleeping children and wishing that I were a child so that I could conk out, too. Perhaps I was being obvious; eventually a man offered me his chair, and with sleeping babe in arms moved to sit on the floor. Of course, the highlight of the service is receiving the Holy Mysteries of Communion. When we have broken our Lenten fast with that heavenly food, and are giddy with fatigue, many of us go into the hall to share rich earthly treats that we’ve been doing without for many weeks. I’m not sure I will want to do that this year; I might need to come home and treat myself with sleep. We have a picnic Sunday afternoon with meat and everything one could want, when we are more rested. So that’s where I’m going after I finish writing this and don my festal garments. I wanted to post at least something in commemoration of this pivotal point in history, and in our salvation history, and then I got carried away. What I first thought to share are these lines that Fr. L read to us instead of a homily this afternoon, words of the risen Christ that I hope will keep echoing in my heart.